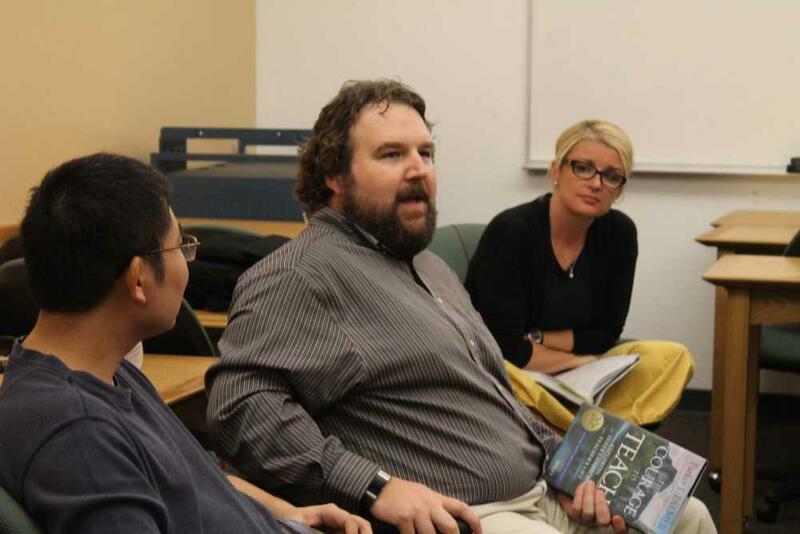 Nick Johnson, an associate professor in the department of management, tells a story about balancing his personal life and teaching in faculty book study in the library Sept. 26. To enhance professional development, Southeast faculty members are taking time out of their schedules to meet for book studies. Groups of approximately 15 faculty members from multiple departments meet every Tuesday or Wednesday for five to six weeks to discuss ideas mentioned in books and how to apply those ideas at Southeast. Themes include anti-racism, balancing life and work and the importance of a well-rounded education. Dr. Bethany Alden-Rivers, associate provost for academic effectiveness and student success, said the books chosen are meant to correlate with national conversations within education. She said she pitched the idea last fall when she first started working for Southeast because the previous institutions she worked at did something similar with positive feedback. Faculty members are studying three books this semester. One book is “Our Underachieving Colleges” by Derek Bok, being facilitated by Dr. Hamner Hill, the interim dean of the College of Humanities and Social Services. “I made the mistake of sending an email alerting people to a blog post about this book, and the next thing I knew I was leading a book study,” he said. Hill said the book discusses the purpose of a college education and general studies. “What do we want our students, no matter what their major is, to be able to do and be familiar with when they leave us?” he asked. 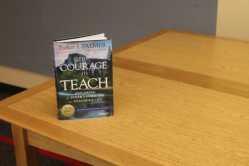 The Courage to Teach by Parker J. Palmer is one of three books being discussed in faculty book studies this semester. The second book, “The Courage to Teach” by Parker J. Palmer, explores the idea of balancing teaching and personal life. An instructor in the Department of Management, Lori Mueller, said she chose to participate in the group because she was eager to hear what the author and her colleagues have to say about the author’s message. The third group is studying “Everyday Anti-Racism,” a collection of essays edited by Mica Pollock. Alden-Rivers said the faculty members that participate in this particular study earn hours towards a new certificate for culturally responsive teaching. She said the Center for Scholarship in Teaching and Learning (CSTL) oversees the book studies. She also said since the CSTL provides the books for the groups and as long as the center has the money to pay for the book, any book is fair game for a book study. “I think people are much more aware of the opportunity to participate, and so we get the book studies filling up more quickly,” Alden-Rivers said. She said she hopes the book study continues beyond this semester, with more faculty and even administrators becoming involved. Southeast senior Peter Reckling used his knack for furniture restoration to preserve original Kent Library furniture over the summer. Reckling, a historic preservation major, spent two months preserving 10 pieces of historic Kent Library furniture including multiple tables and desks, a display case and two chairs. Southeast president Carlos Vargas announced at a press conference with Governor Mike Parson on Aug. 31, a room in Dempster Hall will be transformed into a cyber range, which will serve as a designated work place for cybersecurity majors as soon as the spring semester. “It will provide an enhanced environment for specialized cybersecurity,” Vargas said. The range, to be located in Dempster Hall room 246, will be a work space for Southeast faculty and students to use for testing and training. A former Southeast student, who left school to pursue politics and community leadership, is running for a seat in the Missouri House of Representatives. At 25, Kevin Windham will be among the youngest candidates on the ballot for election to the State House. Still, he clinched the democratic nomination for representative of the 85th District by a margin of 8 percent. Windham says his campaign success was a result of diligence, mentorship and a team of motivated college and high school students who are working towards change.